Will Allen is no ordinary farmer. A former basketball star, he's as tall as his truck, and he can hold a cabbage, or a basketball, in one hand. But what is most special about Farmer Will is that he can see what others can't see. When he looked at an abandoned city lot he saw a huge table, big enough to feed the whole world. No space, no problem. Poor soil, there's a solution. Need help, found it. Farmer Will is a genius in solving problems. In 2008, the MacArthur Foundation named him one. Students will find resources for research and be able to search for books located in our media center on the Powell Destiny Library Catalog homepage. Did you find a book under your couch? under the bed? in the toy box? Bring it in and it will be removed from your library record. Thank you. Please remember to return your books and checkout some of OUR NEW Books! 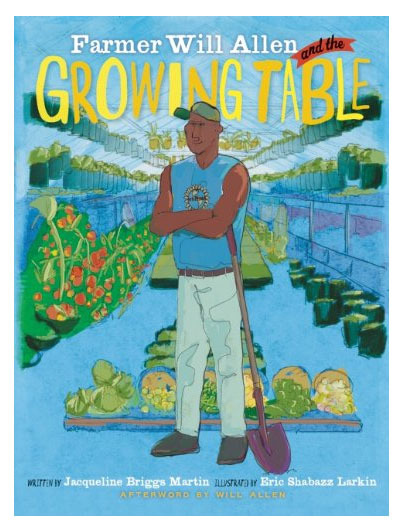 NEWS -- Farmer Will Allen and the Growing Table to be the featured book in President George H. W. Bush's 25th Anniversary celebration of his Points of Lights initiative. The celebration will include an effort to enlist thousands of volunteers to break the Guinness Book of World Records listing for the number of children being read to in a 24-hour period as part of the "Read Across the Globe" initiative. A gigantic conference is planned October 19-21, 2015 at the George R. Brown Convention Center, Houston, Texas. The record is 238,620 and officials are aiming to go past the 300,000 mark with 10,000 volunteers fanning out to Houston area schools and day care centers during the conference to read aloud the children's book, Farmer Will Allen and the Growing Table. Even astronaut Scott Kelly plans to read the book aloud from outer space, although he won't be counted in the tally since he won't be in a classroom. Read FAQs about the book on Jackie's blog. How did the story idea begin? What is the book about? What do red wiggler worms have to do with the story? Book Trailers - Please Take a Look.